Spelling is difficult for many people, but there is much less research on spelling than there is on reading to tell us just how many people spell poorly or believe they spell poorly. Less is known about spelling competence in the general population than is known about reading achievement because there is no national test for spelling and many states do not test students' spelling skills.Almost all people with dyslexia, however, struggle with spelling and face serious obstacles in learning to cope with this aspect of their learning disability. The definition of dyslexia notes that individuals with dyslexia have "conspicuous problems" with spelling and writing, in spite of being capable in other areas and having a normal amount of classroom instruction. Many individuals with dyslexia learn to read fairly well, but difficulties with spelling (and handwriting) tend to persist throughout life, requiring instruction, accommodations, task modifications, and understanding from those who teach or work with the individual. Children gradually develop insights into how words are represented with letters in preschool, kindergarten, and first grade. This process moves ahead much more quickly (and successfully) if instruction in sounds and letters is systematic, explicit, and structured. Spelling of whole words is facilitated when the child understands that words are made up of separate speech sounds and that letters represent those sounds. As knowledge of that principle increases, children also notice patterns in the way letters are used, and they notice recurring sequences of letters that form syllables, word endings, word roots, prefixes, and suffixes. Memories for whole words are formed much faster and recalled much more easily when children have a sense of language structure and receive ample practice writing the words. Inventive spelling or spelling words the way they sound is common in preschool and kindergarten children and is a desirable step in understanding how we use letters to spell. However, inventive spelling is not sufficient for students to learn all of the conventions and patterns of Standard English writing. Encouraging students, beyond the beginning of first grade, to invent their spellings or to ignore correct spelling is not constructive. Spelling instruction that explores word structure, word origin, and word meaning is the most effective, even though students with dyslexia may still struggle with word recall. Emphasizing memorization by asking students to close their eyes and imagine the words, or asking them to write words multiple times until they "stick" are only useful after students are helped to understand why a word is spelled the way it is. Students who have learned the connections between speech sounds and written symbols, who perceive the recurring letter patterns in English syllables, and who know about meaningful word parts are better at remembering whole words. Classroom spelling programs should be organized to teach a progression of regular spelling patterns. After first grade, spelling instruction should follow and complement decoding instruction for reading. Children should be able to read the words in their spelling lesson; most learners can read many more words than they can spell. Understanding correspondences between sounds and letters comes first. For example, before spelling a word, students can orally take the sounds of the word apart. Then, they can recall the letters that spell those sounds. Next, patterns such as the six basic syllable types of English should be taught because they represent vowel sounds in predictable ways. Third, students should be taught a few basic rules for adding endings to words, such as when letters should be doubled, when y is changed to i, and when the silent e is dropped. It is important that students learn to spell words for writing and not just for spelling tests. Transfer to spelling in everyday writing is essential. It helps if the student is taught to use a proofreading procedure that involves checking for one element at a time, such as punctuation, capitalization, spelling, sentence structure, and organization. Computer spellcheckers are not helpful unless the student has already achieved basic spelling skill, at about a fifth-grade level, and unless the student receives other proofreading help. Spellcheckers do not identify all errors. The following perspectives are not formally associated with the above article by the International Dyslexia Association. Dynaread adds these strictly to aid her Dynaread Program users. Spelling and writing are skills that technically follow i.e. 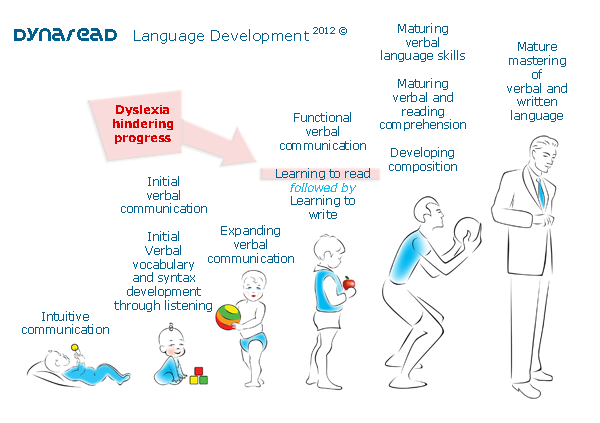 come after reading in language development (see illustration). As your child progresses in reading, we may expect spelling to improve over time. 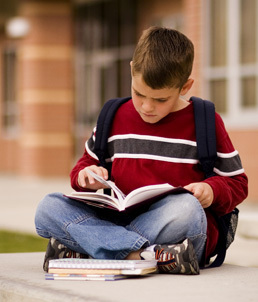 To what extend depends (among other factors) on the severity of your child's dyslexia. There are ways to help improve spelling, of course. Morphographic instruction teaches your child the different components which can make up a word, such as endings like -ing. Older struggling readers however tend to have more difficulties with such relatively abstract definitions of language. Their brain tends to be more geared towards concepts, relationships, creativity, the artistic, innovation, etc., and not so much towards somewhat abstract theoretical structures (think of Diagramming). A practical way is to keep track of common words which your child tends to misspell. Add those to a word wall or have them write the word on a large Stick-It and hang it in the walkways of life. And of course the classic repetition. Research evidences that children with dyslexia have somewhat more difficulty reaching automaticity for tasks. They need more rounds of practice or repetition. Do not shy away from using digital tools like spelling checkers. If you are past Group 25, or ideally past Group 35, it may be a very good idea to let your child master typing. We have good experiences with Good Typing. The beauty of typing in any modern text editor equipped with spelling correction is that they can learn to be conscious about spelling. Another good tool for children in spelling is to learn little memory tricks to help remember. Difference between send and sent? The t occurs later in the alphabet. So we always first plan to send something, and then can look back and say we sent it. Or Dessert versus Desert. We have enough of one desert, but many a sweet-tooth wouldn't mind have seconds of a dessert :-) Etc. Mnemonics offer a similar way. Think of Because: Big elephants can always understand small elephants. It can actually be fun and deeply reinforcing to try to come up with your own together. Work with our Dynaread Readers -- Work with the words in our readers. Instruction is most effective if we remove as many uncertainties and grounds for misunderstanding as possible. Do simple dictations of sentences from the Readers, and identify words that are spelled wrong. Work with those words until they are mastered. Writing the words in their direct context is also beneficial, as it will provide your child with a few more anchors to try to remember correct spelling. Explain the grapheme/phoneme rules (where applicable). Be creative with memory aids: Short statements or memory associations to help remember the spelling. Such as "There is right here" and "Their belongs to the heir." Closing note: Opinions about the regularity or irregularity of English spelling and pronunciation resemble the nature of those between the proverbial half full or half empty glass. English is certainly not regular. This fact actually works in the advantage of the child with Dyslexia, as the manner to master spelling of irregular words is basically the same for children with or without dyslexia (as the regular rules do not apply). When Math advances beyond the initial grades, it requires more reading as well. This article on Online Math Programs refers you to several programs we can recommend. Not at all to suggest replacing reading with online video-based tools, but it would be a pity if your child looses out on developing their math skills because we're working on their reading skills. If you have any great ideas or resources to help your child master spelling, please do let us know. We can then share it with all our users.